Stem: trunk < 15 m, < 40 cm wide; mature crown much-branched, rounded. Leaf: generally 1 per bundle, 2--7 cm, often curved, gray or blue-green; sheath deciduous. Seed Cone: spreading, 3--12 cm, spheric-ovoid, light- or red-brown; stalk < 1 cm; scale tip knobs < 1 cm, angled, truncate. Seed: wing persistent on scale. Ecology: Pinyon/juniper woodland; Elevation: < 2800 m. Bioregional Distribution: c&s SNH, Teh, se SCoRI, TR, PR, SNE, DMtns; Distribution Outside California: to southeastern Idaho, northern Baja California. 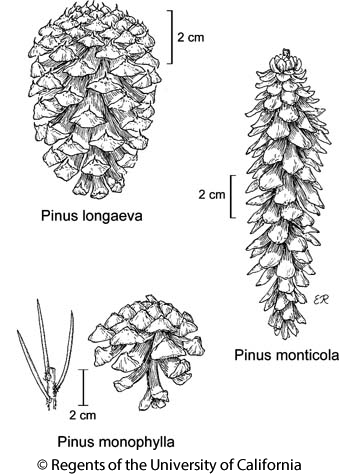 Citation for this treatment: J. Robert Haller & Nancy J. Vivrette 2012, Pinus monophylla, in Jepson Flora Project (eds.) Jepson eFlora, http://ucjeps.berkeley.edu/eflora/eflora_display.php?tid=38284, accessed on April 24, 2019.
c&s SNH, Teh, se SCoRI, TR, PR, SNE, DMtns; Markers link to CCH specimen records. Yellow markers indicate records that may provide evidence for eFlora range revision or may have georeferencing or identification issues. Purple markers indicate specimens collected from a garden, greenhouse, or other non-wild location.